For a couple of months I have been wrestling with fears. Fear of not ever getting back to PNG, fear of going back “too soon”, fear of being a bad mother or a bad wife, fear of being a bad missionary, fear of letting go and holding on. I have never been a soldier in a war, and I certainly do not claim to know what it is truly like. But from talking to, listening to, and reading accounts of veterans from different conflicts, I have gotten the sense that, at least in one respect, being a missionary is the same. You will never be the same person you were when you went as when you come back. I am beginning to realize that for my situation, it has been ultimately for the better. I certainly did not feel that way many times while in the midst of circumstances that were cracking, breaking and at times completely shattering me. 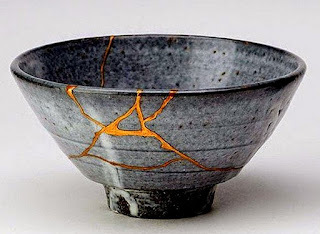 But in the end I have emerged feeling very much like a piece of kintsugi pottery; Kintsugi is the Japanese art of repair using a lacquer mixed with gold, silver or other precious metal powder. It is done in this way so that not only is the broken part not hidden, it is emphasized as a part of the object’s history of its existence; accepting that flaws and imperfections are a part of life and part of the story. In the same way, we, the vessels of God do not come through life unscathed. And rather than hide the wounds, we ought to allow God to purify them and repair them, acknowledging the process and the end result as part of who we are now. To that end I wanted to share a song and scripture that have been a help to me during these last couple of weeks as the pace of our journey back towards PNG has picked up. We usually attend both a Sunday and a Wednesday night service. Every time we sing it in church I feel encouraged to continue on, to not let the fears hold me back. So, when I was looking up the lyrics to post here, I was delighted to come across a video where Chris Tomlin is talking about writing this song, and there were two parts that really hit home for me. First, he said that he had decided he wanted to write a song with his friend, Ed Cash (whom he has written with before). When he texted him, Ed texted back how weird it was for Chris to ask because in the middle of the night the previous night when his wife had woken him up asking for prayer because she was feeling as if there were things coming against her. While he was praying he felt inspired to start singing a chorus that came into his mind. And in the morning he had thought he should send the portion of the song to Chris. So, they worked together and what resulted was Whom Shall I Fear. Secondly, Chris went on to say how some songs, like this one, are inspired and are like prayers. Both of those points struck me and are true in my life. I have more times than I can remember, woken Evan up and asked for him to pray for me, for our family. And, though I make absolutely no claims on being a great singer, when I do, often it is a prayer, a cry to God to work these things in me. Give me strength, faith, endurance, courage to continue to step into this life I never imagined having, but choose out of obedience to Your Will. "Whom Shall I Fear (God Of Angel Armies)"
That is the point isn’t it? We are showing our brokenness on the outside, where people can see, relate, and hopefully feel that if someone doesn’t have to be perfect to be a friend of God, all of us should be encouraged to seek Him too. And it goes further than that. In 2 Kings 19 Jerusalem comes under siege by the Assyrians. Before this happened King Hezekiah, who knew the Assyrians were coming, had the part of the spring of Gihon which was outside the city walls be blocked off and routed through the west part of Jerusalem in a tunnel (which still exists today) so that when the siege came, the people would have fresh water. There is reference made to this in 2 Chronicles 32:30. Even with this, Hezekiah needed encouragement, which he got in the form of a prophecy sent to him, recounted in 2 Kings 19: 32-34. I believe that God doesn’t just come along at the end and repair us. He is with us through the times where we are getting tumbled, trodden and beat. He has provided us with an internal spring, a river, like the spring of Gihon that continually offers us refreshment, comfort and solace when we need it. And when we are not in dire straits our gates should be open to offer it to others. Last night I was listening to a sermon on the book of Nahum. It has been such a cool thing to dive into the “sticky parts” of the Bible as the pastor likes to call them; because they are the portions which don’t get much read, much preached on, so the pages aren’t ever broken from their sort of stuck together state that all the pages start out like when the Bible is new. But I have come to realize, they are sticky for another reason. Sometimes the truth that emerges can be tricky and hard to know what to do with. At first I was only struck by the second part. In Papua New Guinea, the skies are so big. When a storm or wind comes through our valley it is indeed awesome, and the clouds are immense. When the dry season comes and there is dust everywhere, and there is need for rain, there are fires lit in the tall kunai grass on all the hillsides. Unconfined fire crackling and being whipped up by wind, it is the first time I could truly visualize “tongues of fire” spoke of in Acts 2:2-3. It is tremendous to know that a God that is so big, so powerful, He is greater than all these things, and is IN those times where we are feeling surrounded in the midst of a storm. I pray you are blessed and at peace. Thanks for reading. The words that are expressed herewith in this blog are mine and mine alone. They are not to be affiliated with any other person or group. Our family resides in the Eastern Highlands province of Papua New Guinea. We have two boys. We are originally from Oregon in the US.